Something came over me and I decided to clean up my sewing room yesterday. My sewing room seems to be the place where things get dumped (or hidden). It became a very un-inspiring space and I don't know about you, but me personally, if my sewing room is messy and unorganised, I can't sew. I just don't feel inspired to be in there to create anything. So anyways, I decided to start clearing up my sewing room. I began with my pressing / cutting table which sits against a wall. I had piles of things taking up half of my cutting space; books, magazines, patterns which I've liked the look of and printed up, scraps of fabric, plus the general bits and pieces associated with sewing. With a clear table, I cleared up the spaces around the table where I'd stacked overflowing boxes. One of the boxes had some fabric which I'd ordered from the Fat Quarter Shop months ago, but hadn't gotten around to sorting (much less using). 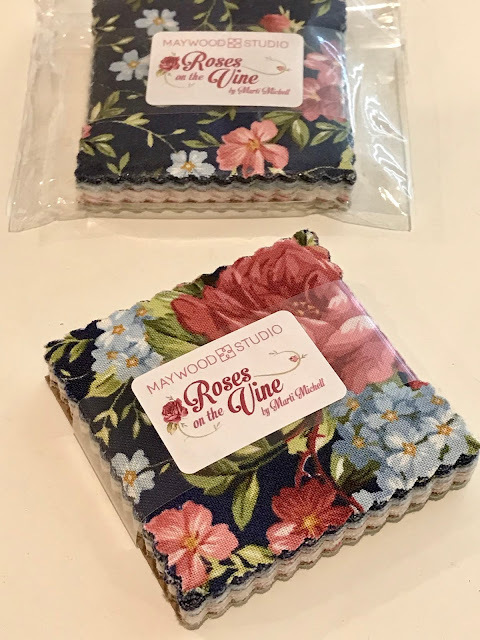 Here's the direct link to Roses on the Vine at Fat Quarter Shop. In this box, I found a couple of sweet floral mini charm packs which I'd ordered on a whim. These little packs of loveliness are super cute, cheap and often quite handy when you only need small pieces of fabric for a project. I separated the squares into light, medium and darks and then decided on a "sort-of" pattern. Light prints were placed in the centre and then working outwards with the medium and then finally the darkest prints. I wanted to make a big 18" cushion for my lounge, so ended up with 9 x 9 square configuration. That's 81 mini charm squares, which is 2 packets of mini charms (with 2 squares left over). Perfect! I took a quick picture of the layout with my phone which was turned out to be very handy because I went back to this photo many times to ensure my layout was still correct. Once all of the squares were sewn together I sandwiched 2 layers of batting to the patchwork top. This cushion is going to get heavy use, so I want it to be strong and stable. I chose an organic line/leaf quilting design which has become a favourite. It's really easy to do and and a nice alternative to my usual stipple. I chose a Cotton & Steel cat print for the backing and quilting this too before finishing the cushion with an envelope style back. I love this cushion and its my first one in my bid to make all new cushions for the couches in our family room. Tomorrow, I'll clean up some more of my sewing room... and find possibly reward myself with some more unplanned sewing. That is really pretty! I like to reward myself with sewing after cleaning too, although most of the time, I wind up rewarding myself before the room is actually clean. After all, I am "cleaning" by using the fabric! What an adorable pillow! 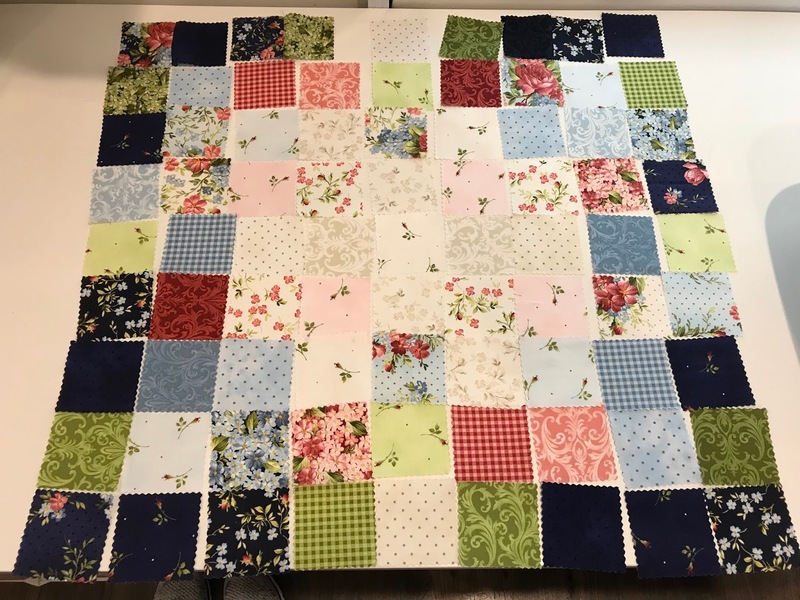 A lovely way to use up squares! that's such a pretty cushion and range of fabrics, I like a tidy area to start working in too.... not always easy to keep it that way though.